Since a horse’s teeth are constantly erupting, they would continue to grow longer if the horse did not naturally grind them down when he chews. Due to the anatomy of the mouth, the teeth in the wider upper jaw are not set evenly with the teeth in the narrower lower jaw. Most of the grinding surface of the teeth is contacted, but not the edges. As the horse gradually wears down its teeth, he does so unevenly. The uneven wearing causes sharp points that can cut and pinch the cheek along the upper molars. They can also lacerate the tongue along the inside of the lower molars. Some of the most common dental procedures performed are removal of sharp points (floating), removal of caps (retained deciduous premolars), removal of retained incisors, extraction of wolf teeth, and removal of long hooks. Other less common and more complex problems include dealing with tall teeth, broken or loose teeth, abscessed teeth, and misaligned incisors. Power Float - A power tool that has a small grinding disc mounted on a handle attached to the electricity-powered base. This instrument allows each tooth to be addressed individually and can be done in less time and with less trauma to soft tissues then manual floating. Speculum - A device that is placed in the mouth to help keep the mouth open. Sedation - Medication used to make your horse feel sleepy and relaxed. The medications used act quickly, keep your horse standing, and wear off in 15 to 30 minutes. The floating procedure is not a painful experience for your horse. Some horses are anxious about or resistant to mouth manipulations, so it is not uncommon to sedate the horse. Sedation allows for a more thorough floating with less stress to the horse. To avoid dental problems, it is a good idea to allow your veterinarian to perform a dental exam on your horse at least once per year. 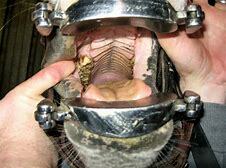 Not all horses need to be floated annually- timing depends on the individual variations in your horse’s mouth anatomy. Once problems have formed, it may take intensive treatment with frequent floats to return your horse’s teeth to normal. Dominion Equine Clinic veterinarians are educated in the anatomy and physiology of the equine mouth, fully trained in appropriate dental techniques, and will provide the best possible dental care for your horse.